There’s no future for trade unions without young workers, and recent campaigns in the hospitality sector show that they can be organised. With a perfect storm of low wages, insecure jobs, and few training opportunities, it’s little surprise that young people aren’t joining trade unions. It’s not that we aren’t political or are anti-union, but most of us don’t interact with unions in our day-to-day lives and therefore don’t really know what they are for. The campaign for fair pay, tips, and work in the hospitality sector is changing all of that. It shows that the labour movement is beginning to prepare the ground for a new wave of trade unionism among young people. 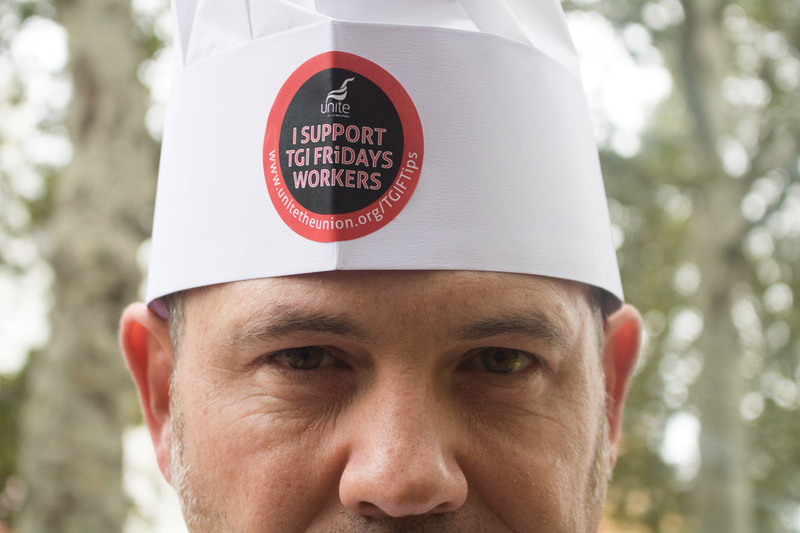 I’m a waitress, and have been a leading activist in the fight by workers in TGI Fridays to be treated fairly at work. What it’s taught me, and my trade union Unite, is that recruiting and organising young people really does mean starting at the bottom. My parents are teachers, and have trade union backgrounds. I grew up knowing what trade unions were. But for most of my colleagues, generally younger than me and born almost a decade after Thatcher resigned as prime minister, they didn’t have a clue. Thatcher’s vicious anti-union laws and the deindustrialisation of our communities left a generation that grew up without trade union members in their families. These young people didn’t learn about trade unions at school either — which is why Jeremy Corbyn’s commitment to put trade union education on to the national curriculum is so welcome. But in TGI Fridays my colleagues and I learned quickly about the reality of the modern workplace. The catalyst for our campaign was the company sitting waiting staff down and, with just two days’ notice, telling us that 40 per cent of our card tips was being reallocated to the kitchen teams. It’s an old trick to play staff off against each other this way. But in this case it was clear the company simply didn’t want to pay the kitchen staff more than the minimum wage — they were using our tips to fill the gaps. A number of us decided then that enough was enough and that only strike action would stop our employer treating their staff like this. We joined Unite and the union put its faith in us to build membership our way — which first meant producing leaflets that explained what a trade union was, what unions had won for workers in the past and what they could do for us today. Our organising techniques were a bit unusual, using social media to contact workers in restaurants around the country. This started by asking around to see who knew someone working at another TGIs. We would then get their mobile number and add them to a WhatsApp group. This enabled us to get simple messages about joining the union out to colleagues without needing to meet them in person. We also used Facebook, which allows you to see who has listed themselves as working in TGIs. So, for example, we’d find someone working in Reading and one of us would cold message them saying ‘I’m a waitress and I’m not happy about what the company is doing. Would you like to join us?’ The vast majority of people we contacted got back to us and were positive. We managed to recruit about 250 members in the space of six months, which might not sound like a huge amount but is quite impressive when you consider that most people who signed up had no knowledge of trade unions before and were working in a sector that is notoriously difficult to organise. Trying to bring people into a union in a workplace where there is no recognition and where the employer has no intention of providing it is really difficult. TGIs used scare tactics and union busting techniques, including circulating totally dishonest material that denied what Unite was saying even though we had the evidence to back it up. But this wasn’t the height of it. I was suspended from my job after speaking at Unite’s policy conference in July. For just talking about the dispute to other union members I faced being disciplined and almost certainly sacked. That was avoided thanks to the hard work of Unite officials, who threw the book at the company for union victimisation, and with the support of my family I was able to get back to work. TGI Fridays workers, those from McDonalds and Wetherspoons who joined us on strike during the day of action last October, along with the Ritzy cinema strikers fighting for the London Living Wage, are proving that hospitality workers — and young people more generally — are possible to organise. Yes, the hospitality sector is difficult terrain, and it’s been many months of struggle, but our efforts are paying off. And while I’m sceptical about the prime minister’s announcement that employers will be banned from taking tips from their workers, it does seem that our voices are helping to change the national conversation. There’s a high turnover of staff in hospitality and a lot of people go into the job with the view they will only be there six months. The reality however is that a lot of people, even after they’ve graduated, tend to stay in these jobs, which is why we are pushing the point home that they need to join a union. Hospitality and retail are gateway jobs. Most young people, unless they are trust fund kids, will start there. If we can get people to join unions at this stage in their working lives then there’s a much better chance they will take those union values forward into later careers. October’s day of action was my seventh picket line of the year, and the most important. It was organised alongside the bakers’ union, BFAWU, and sent a strong message that we won’t be separated, workplace by workplace. The hospitality sector as a whole needs to change. Our demands are not big. We want an end to zero-hour contracts, which not only make our work precarious, but are too often used by unscrupulous employers as a punishment for vocal trade union members. We want to be paid the real living wage, a wage that will allow people to live, not just survive. And we want an end to discriminatory youth rates. Young workers deserve secure work, with guaranteed hours and to be treated with dignity. But too often we have low expectations, which are a key barrier to union organisation. I sometimes feel that young people genuinely don’t know that they can do better. It’s up to young workers to educate our colleagues and encourage them to organise. We’ll need trade unionists everywhere to support our campaigns. This fight really is important to all of us, because it’s the fight that is going to keep the trade union movement alive. Lauren Townsend is a waitress in TGI Fridays and an activist with Unite the union.